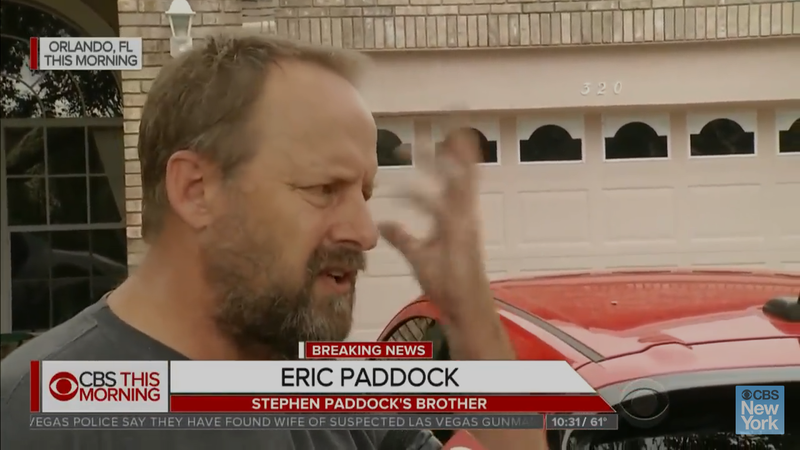 When I watched the interviews of Paddock’s brother Eric I thought he was a strange guy. And when I mean strange I mean a little psychotic acting. A few things he said in his interviews were strange, for example (and I’m paraphrasing) “it was like a asteroid fell on top of us”, “it was like Mars fell into the earth”, “he was a normal guy, he liked burritos and Taco Bell”, and the one thing he kept doing was this thing with his left hand as if his mind was being blown. It wasn’t only his hand gestures but his face and eyes. It was strange. So as you can see I wasn’t the only one to catch it. I think this guy knows more than he wants us to believe. He actually comes across as if he may be under some sort of hypnotic spell. He fronted off his brother the day after his first interview and came out and said that he was a “lone shooter and he had no help”. You would expect a family member to be in denial at first but not this guy. Besides I don’t honestly think Paddock shot any gun on October 1st. But what’s really up with this mind blown hand gesture? Now its interesting that this phrase “mind blown” comes from the hippy LSD culture. And if you have researched it then you know for a fact that the military used LSD in their MK Ultra Monarch program. So is Eric Paddock using this phrase coincidentally or are these demonic occultists subconsciously spilling the beans and not even knowing it? I’ve already suggested, as others have too, that Steven Paddock could have been a MK victim. And these types of things may have been more than coincidence. If you listen to the lyrics of this song you’ll notice at the end of the chorus he says “your feet are on the ground and your shoes are filled with led”. I’m not gong to read into anything but this is the first known song to proclaim to “blow your mind” and it comes from the hippie LSD culture. 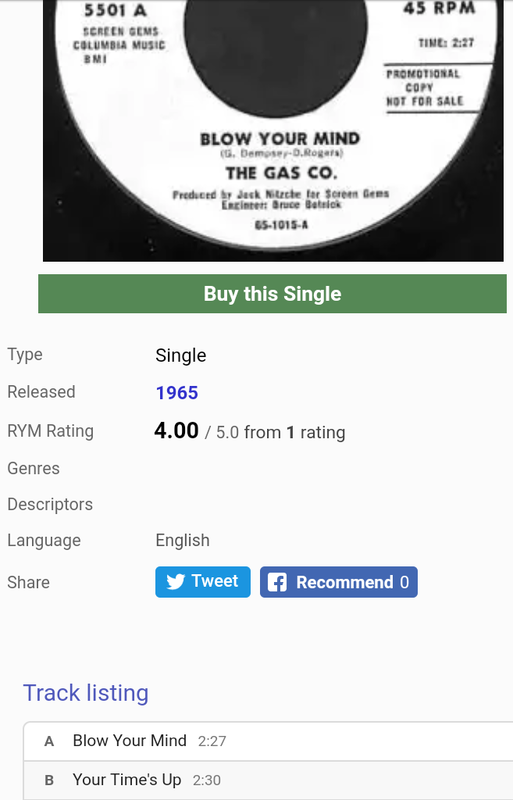 Not only that, the B side to this 45 is “Your times up”. That’s also another interesting connection. It seems on October 1st time was up for some and this patsy literally had his mind blown. So if that isn’t strange enough..here is where this gets really weird. 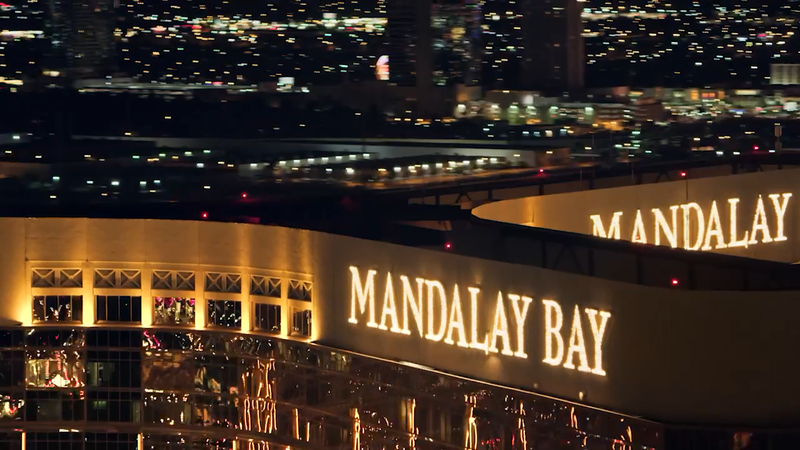 2 weeks ago the MGM Corporation who owns the Mandalay Bay rolled out a new campaign for Las Vegas. Welcome to the Show: one mission: blow the mind of all mankind. 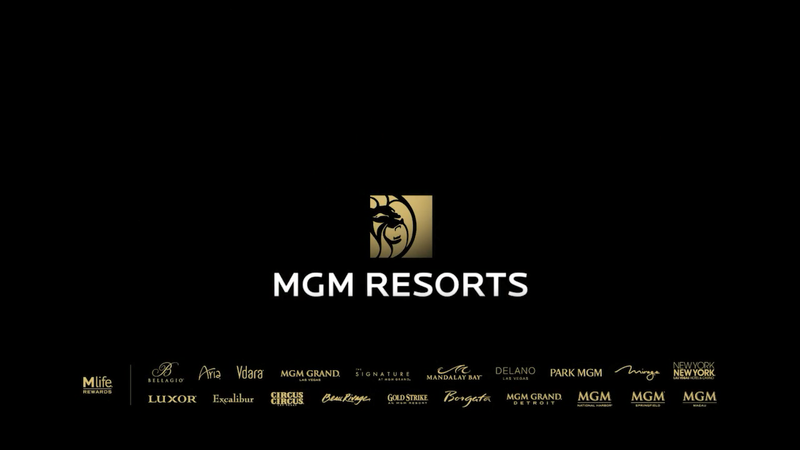 “MGM Resorts International released its first corporate branding campaign two weeks before a gunman turned one of its resorts into a perch for the country’s deadliest mass shooting. The entertainment company shut down the campaign Sunday night as its employees worked to help the wounded, said Lilian Tomovich, MGM’s chief marketing and experience officer, at the ANA Masters of Marketing conference in Orlando, Fla., today. 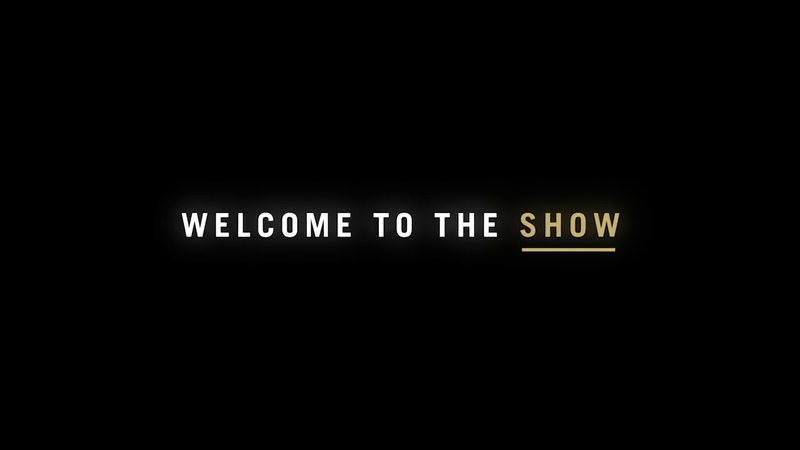 The ill-timed campaign from McCann was called “Welcome to the Show” and featured a line that MGM had “one mission: blow the mind of all mankind.” You can watch the 60-second TV spot below. MGM spent 18 months crafting and implementing the initiative internally before debuting its integrated campaign to the public. The goal was to transform it from a hotel and casino business to a global entertainment brand, a move it saw as vital after the recession of 2008 nearly bankrupted the company. First notice the 18 months it took to get this campaign together and the 77k that it will affect. Those who know numbers know what these mean. Does that remind you of a certain psyop called Anonymous? Before I go on look at the above picture that says “holy” on it. What do you see? A colored woman? Well look below and you will see this divine feminine piece that a group called Catharsis is putting up in front of the Washington monument or what I like to call a symbol of Osiris’ phallic. Coincidence…maybe. It’s still not funny though. Nothing holy about this statue or Vegas. So what’s up with this campaign? 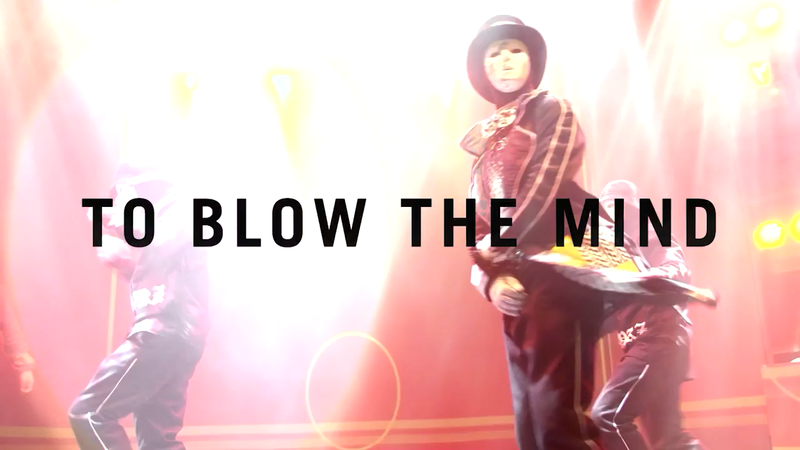 Welcome to the Show” with the MGM oneliner “one mission: blow the mind of all mankind.” Blow the mind huh? Like Eric Paddock or more along the lines of his brother Steven? Those two have had their minds blown in two different ways. 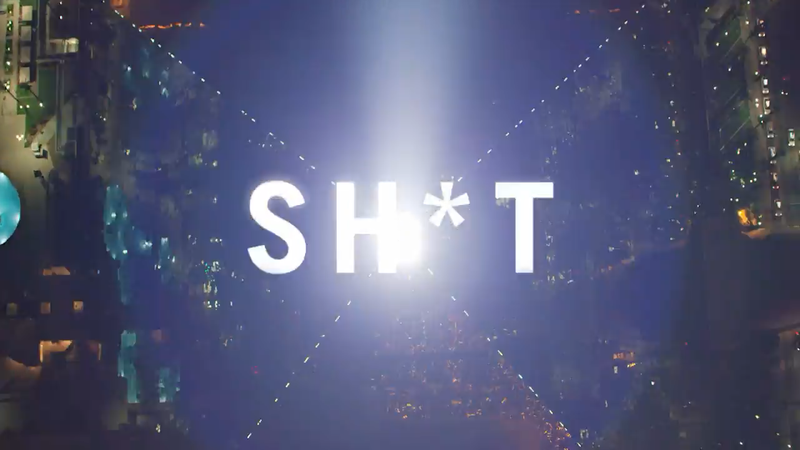 I find it so strange that this phrase has been coming up in relation to this Las Vegas occult ritual and there is a strong connection to the government’s mind control program MK Ultra. But I don’t think the Paddock bros are the only ones getting mind funked ala Criss Angel at the Luxor. I think this ritual of blowing minds was for everyone spiritually speaking. This is a psyop. It’s pretty simple to see. This was done in part to control the masses. People are screaming HOAX!! while the another side is screaming false flag while another side is screaming everything about this shooting is completely honest and true. There needs to be found a happy medium here. Yes people got shot and died. Yes there are actors in this drama and yes everything is not how it seems. They mix, as well as Satan, the truth with the lies. This is how this game is to be played from now on. Its about causing confusion and chaos. Iys as simple as that and honestly it’s working great at this point. This is how I see it. Look at how much disinfo is coming from the media and then to add on top of it, you have everyone on social media adding to the confusion. This wasn’t just about a physical ritual sacrifice. It has many spiritual components to it. The eyes being shut in the picture they have posted of Steven Paddock are very telling for the public. This is for those who think they know but are still asleep. The “mind blown” of Eric Paddock Season 1 is saying something that we all need to understand. MK Ultra went live on the public and we can see it happening right now. This just wasn’t intended for those on the groundd in Vegas…it was intended for everyone. Mind blown yet? No…not for me. I believe a day or two before the Manson murders that Charles Manson, who was a struggling musician, visited an MK Ultra hypnosis ‘spa’ in California that used LSD on their patrons. The spa was recommended through Timothy Leary “turn on, tune in, drop out”. Check these two quotes from Manson Family – “LCD drew stuff out of your mind…” MIND BLOWN? “Manson uses mind-altering drugs himself in order to contact spiritual beings, and gain supernatural powers” Tex Watson, Manson Family Killer. One of many examples that ties the occult, rituals, and mind control together.